This entry was posted in Take Action, Uncategorized. Bookmark the permalink. 2016 (?) 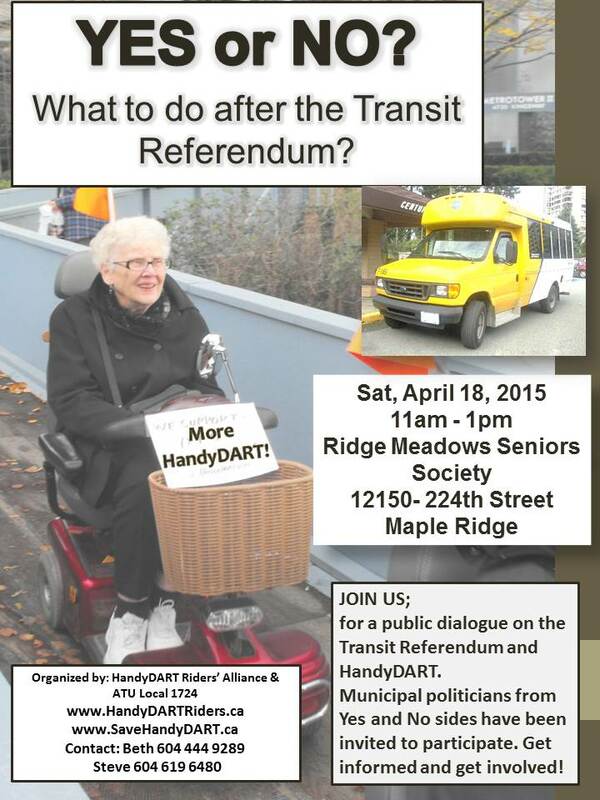 BC Elections is a good year to start a ‘RIGHT THE WRONGS CAMPAIGN’ to correct the BC problems existing in TRANSLINK. About 35 years ago government introduced the South Coast British Columbia Transportation Act – TransLink. The prime purpose was to create a transit system that would provide an alternate way other than automobile. Since it has undergone numerous and confusing amendments to make it what it is now, an organization very much failing according to reports this year. The transit system in its entirety is vital in the South Coast of BC. The numbers of people it moves grows exponentially annually. TransLink reports indicate funding problems based on TransLink income. It therefore is cutting back on services. Handydart has had its budget frozen for10 years for example. At the same time governments are pressed for financing. A problem faced because of a wrong ended tax policy of reducing taxes on big business. 1. The first question seems to be where is the money to come from? We need to elect a government unafraid to make all taxation fair and equitable. The time has come to make Business and High Finance pay a fair share of the tax burden. TransLink has spent monumental amounts of money on road improvement, bridges and other highway improvements. It should be given to the Department of Highways and let TransLink work on people movers. The money saved here could well be in the billions. 2. Next it is time to right the wrongs begun under the Campbell Premiership. Return TransLink Board to a mainly elected board of Mayors. They know better transit problems in their area and are subject to their people’s approval through elections. The existing Board of professionals should be removed with a thank you only. 3. Make all business corporations under TransLink non contracted services by removing ‘contracted service’ from their contracts. This or next year is an elections year. Voters have a chance to demand that your candidate, if elected, will do all in their power if to make these three points in our position government policy. It would go a long way to improve public transit in the lower mainland. (South Coast BC). Vote for a government unafraid to introduce fair taxation. 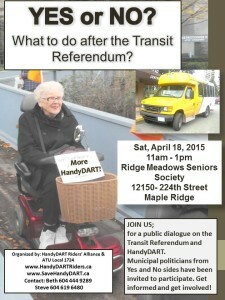 In the meantime vote YES on the Transportation Referendum. yes we need handydart every day for fredom andthe rest . i bruce alexanderhave twice a week and i cant do with out it can you??? ?.PLEAS HELPOUS OK.ps all for one and one for all.thank you handydart..